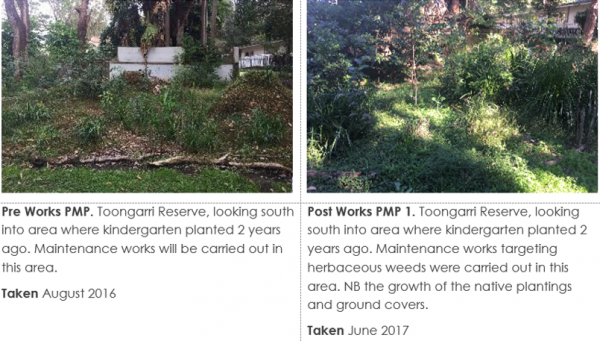 Restoring Toongarri Reserve has been a collaborative effort between the community and our crew. One of our bush gurus, Paul Webb, has been supervising Toongarri Reserve Bushcare group for the past 5 years, but members of the community that live near the site have been working there for much longer! Our talented Site Supervisor Jen Coleman and Leading Hands Jocelyne Morey (who has sadly left us for a seachange), Claire Cashel and Rachel Dryden along with crew members Josh Higgs, Blake Hawke, Gemma Jones, Melanie O’Donovan work hard to restore and maintain this site. Toongarri is located in Avalon and contains remnant Swamp Sclerophyll Forest – an Endangered Ecological Community (EEC). The EEC is surrounded by residential properties and a lawn area which causes the site to be constantly inundated with weeds. The site is made up of 3 vegetation islands and a strip of bushland behind the northern properties. All in relatively good condition. The aims set out for Toongarri Reserve were to target weed invasive vine weeds, control exotic grasses along all edges and maintain previous works areas, working with the local volunteer group and removing any weeds occurring in and around their plantings, with an overall aim to preserve and restore the EEC. Works included primary works along the northern boundary targeting exotic vines Ipomoea indica and Delairea odorata growing throughout the mid-story and canopy. We were successful in reducing all mature vines species with only juvenile seedlings occurring in small numbers. 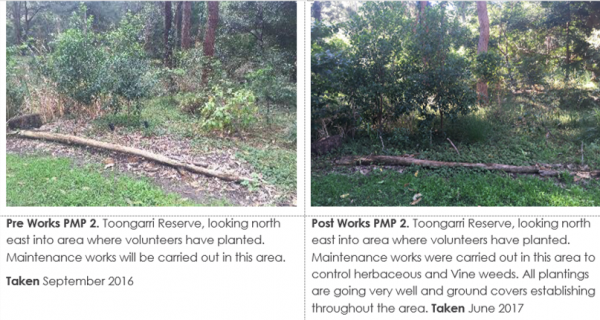 Maintenance works are carried out throughout entire reserve supporting the local volunteer bush care group. Works include regular sweeps throughout the contract areas targeting all herbaceous weeds via manual removal and spraying works. All areas were hand weeded before spraying, working from areas of high resilience to poorer areas. These works were successful in the overall reduction of weed volume throughout the entire reserve. All works were carried out with the aim to reduce and control all herbaceous weeds and exotic grasses throughout previously worked areas and in and around volunteer planting areas. The annuals Sonchus sp., Bidens pilosa and Solanum nigrum were all removed from amongst native plantings and propagules bagged. Exotic grasses, mainly Ehrharta erecta, were all manually removed from native ground covers and sedges. All maintenance works were carried out by trained bush regenerators who could identify areas of high resilience and work from these areas pushing into poorer areas. Due to the success of these works and the hard work by the bush care group the percentage of native ground covers and grasses has increased significantly. Photo Monitoring Point 1 shows the area where the local Kindergarten children planted plants. All plants within this area have successfully established and ground covers spread due to the manual removal of all weeds. In late 2017, we were successful in getting another contract for this site and we are now continuing carrying out maintenance works. In the future maintenance works will need to be carried out to keep this reserve in good condition. We are keen to thermal weed through this site as it is a very successful method of treating Tradescantia fluminensis.